Description: UP 5001 waits on the Hot dog track as the Juice goes north. Description: Running over 5 hours late due to snowstorms in western New York, Q114 slowly rolls past the old Southworth Paper Mill in West Springfield at 7:50. Description: The westbound CSX-Pasco, WA merchandise train crosses over to main 2 in Hawley to let a Z-train behind it on main 1 pass by. 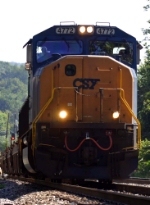 Notice that this is technically a "CSY" locomotive. 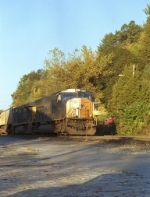 Description: A photo me filming a northbound CSX intermodal train. Photo by Kathy Tos. Description: Do you feel small?